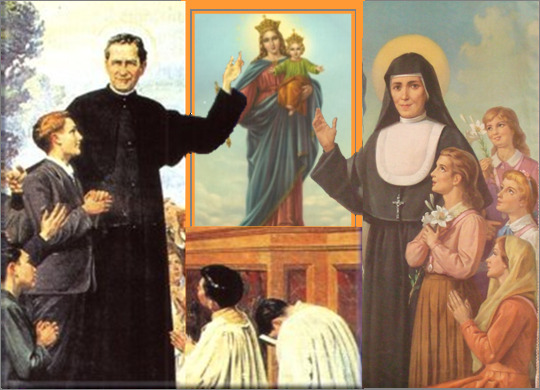 We, the Daughters of Mary Help of Christians also known as FMA or the Salesian Sisters of Don Bosco are proud to belong to a vast movement known as Salesian Family. Our Institute was founded in 1872 by St. John Bosco and St. Maria Domenica Mazzarello through the direct intervention of Mary and as a response to the profound hopes and aspirations of young people (C1). We commit ourselves to educating and serving young people of all ages especially the poor and marginalised. Our Educative mission is carried on in the style of Don Bosco’s Preventive System based on Reason, Religion and Loving Kindness. We also assist women and young people at risk and accompany them in their search for meaning in life. Our Institute numbers nearly 14,523 world-wide and is the second largest Community of Religious Women in the world. We are consecrated to God, unafraid of confronting the challenges encountered in the world of youth. A simple but deep prayer life, a strong community life, and a youth-centered ministry energise us to face life’s challenges in order to bring about a more just and humane society. Our Province known as the Province of St. Mary Mazzarello, Mumbai (INB) was canonically erected on 24th May 1982. We follow in the footsteps of Jesus who came to bring “Good News” to the poor. We commit ourselves daily to work for the poor and underprivileged young people and women with the heart of Don Bosco and Mother Mazzarello. Our Province reaches out in service to the four states of our Country – Goa, Gujarat, Karnataka and Maharashtra. We have 32 Centres in our Province carrying out various ministries such as Educational Ministry (formal and non-formal), Youth Ministry, Social Ministry, Media Minsitry and Pastoral Involvement in the Local Church. In our educational services much importance is placed on Faith-Formation, Value Education and Media Education. We reach out to young people and women through our mission of love in different types of schools, youth-centres, boarding homes, student-centres, professional schools, shelter-homes for street children, community colleges, hostels for working girls and women empowerment programmes including SHGS and integral human-social promotion through as health-education and livelihood programmes.